What to do? Where to go? 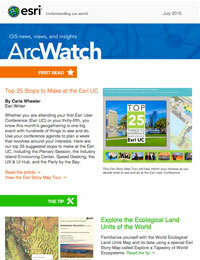 You will be faced with many choices everywhere you turn at the Esri User Conference. Choices. 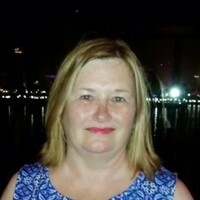 You will be faced with hundreds of them when you walk through the doors of the San Diego Convention Center next week to attend the 35th annual Esri User Conference (Esri UC). Chances are you will definitely want to attend tech sessions and demo theater presentations that relate to your work, tour the Map Gallery at least once, and hear the Keynote Address by former Maryland governor and presidential candidate Martin O’Malley. But where else can you spend 120 hours at the conference, minus the time you need to sleep, sightsee, embrace the restaurant scene, and otherwise soak up San Diego? Whether this is your first or thirty-fifth conference, deciding where to allocate your time at an enormous conference like the Esri UC is always difficult. 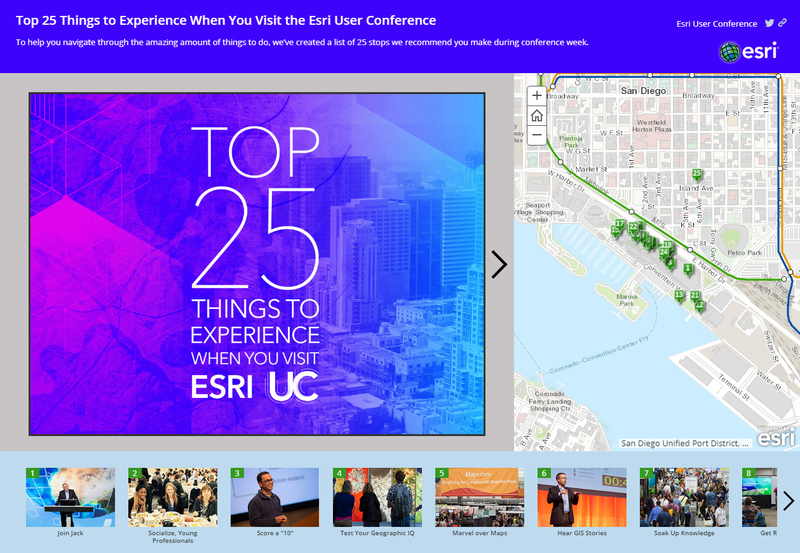 To help you navigate through the plethora of things to do, we’ve created the Top 25 Things to Experience When You Visit Esri UC Story Map Tour. It’s a list of 25 stops we recommend you make during conference week, which starts Saturday, July 18, with events such as the Esri Business Summit, and wraps up Friday, July 24, with the Closing Session. All the events in the Story Map Tour, which also are included in the story that follows, will take place at the San Diego Convention Center unless otherwise noted. This list is by no means all-inclusive, so please consult the agenda to tailor the list to your interests. 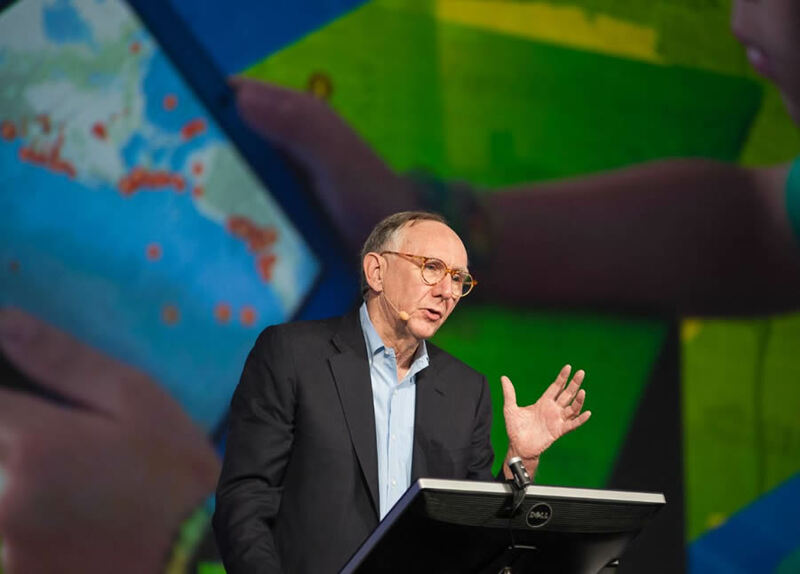 Esri president Jack Dangermond lauds the work you do with GIS. Nibble on snacks and see the maps during Monday's Map Gallery Opening and Evening Reception. 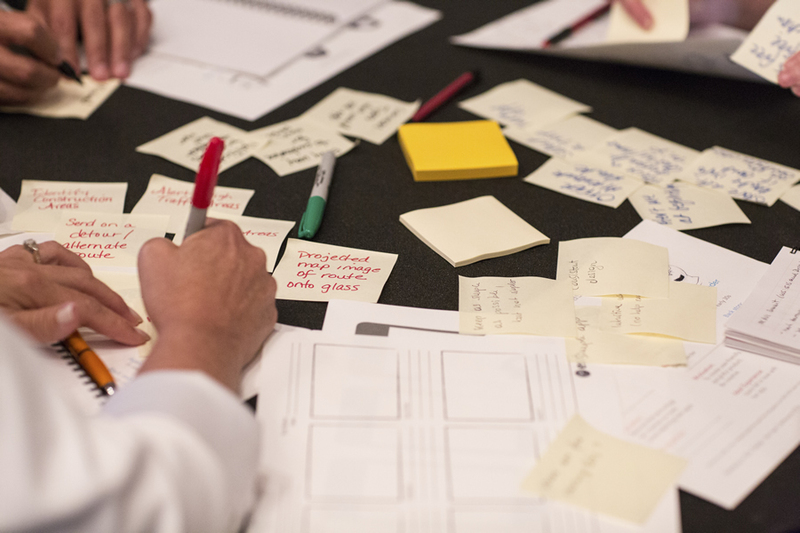 Try out different design ideas at the UX & UI Hub. 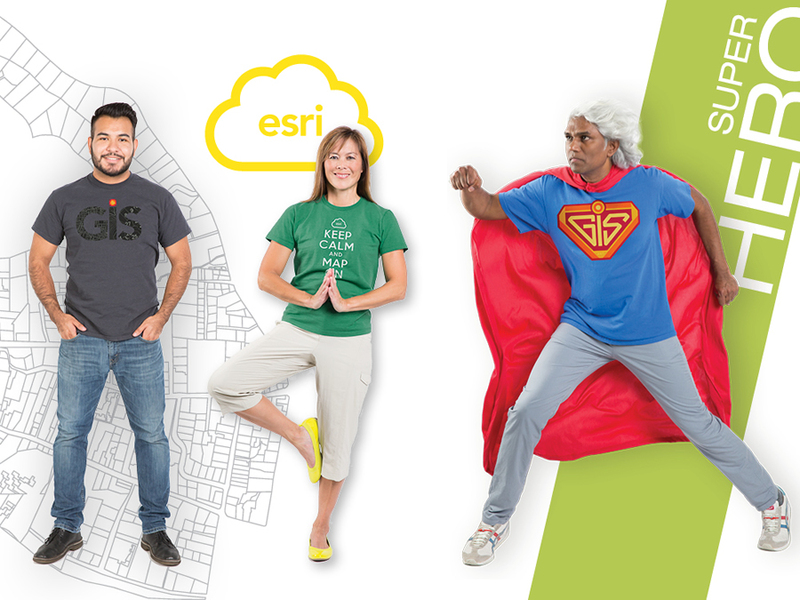 Get your geogeek on with these GIS-themed t-shirts, sold at the Esri Store. Relieve some stress by taking yoga. 11. Take Training, For Free! 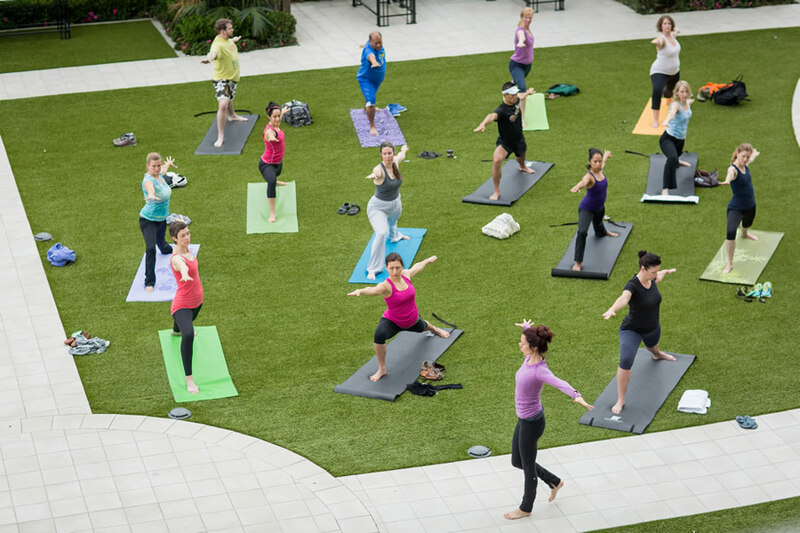 Strike a pose such as the bridge, hare, tree, bow, cat, and upward- and downward-facing dog during yoga at 6:30 a.m. Tuesday, Wednesday, and Thursday on the grassy area near the Hilton San Diego Bayfront and the Embarcadero. Emerge victorious. 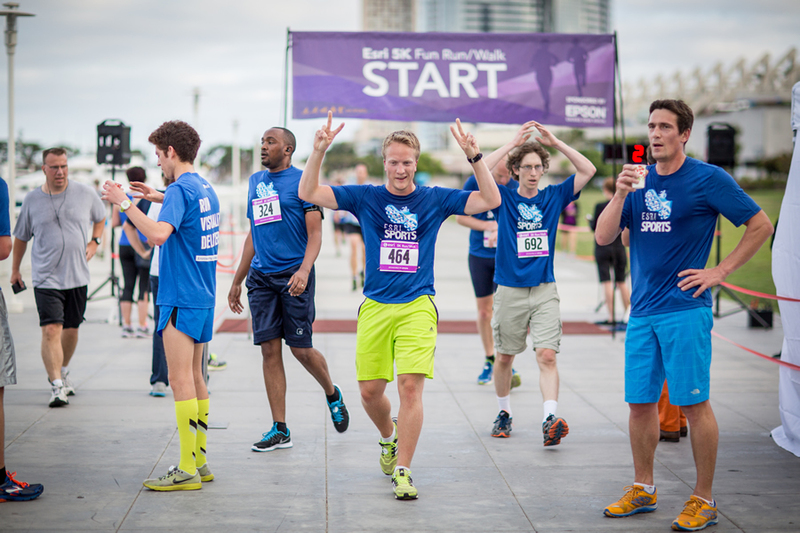 Join your peers for the Esri 5K Fun Run/Walk. 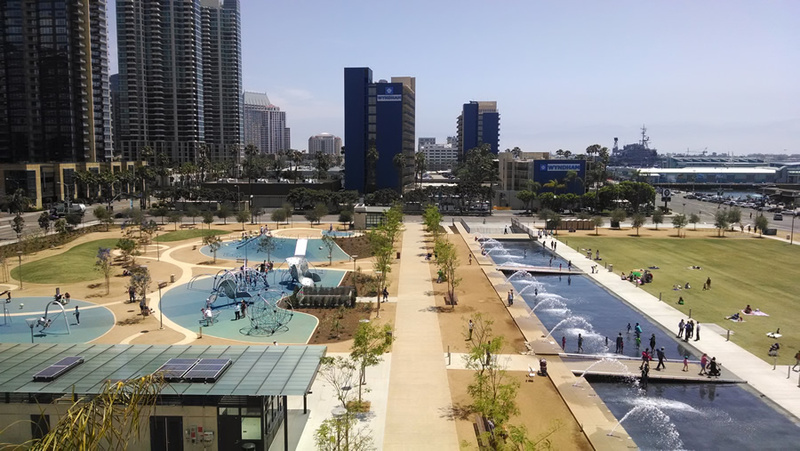 The Party by the Bay on Thursday night will be held in the new Waterfront Park in San Diego. 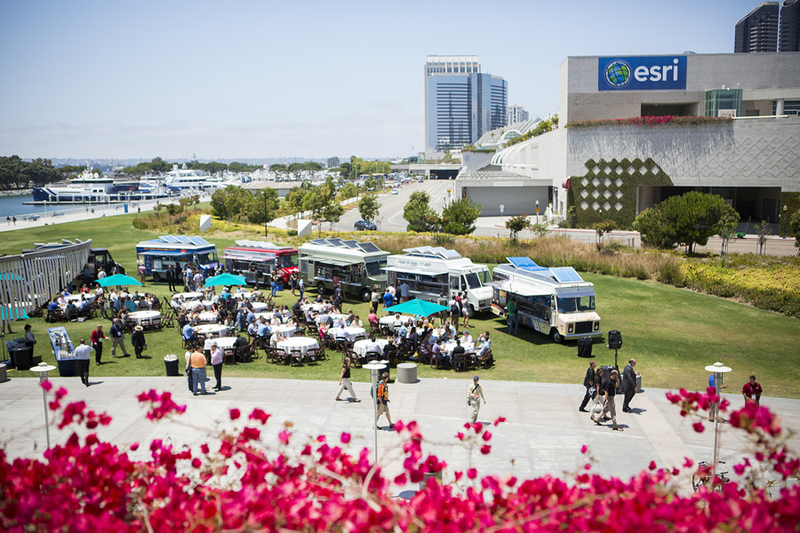 Walk or take a shuttle to the new San Diego Waterfront Park for Esri’s Party by the Bay. You will enjoy delicious food, great musical performances, and fun, interactive games. The party will be held from 5:30 p.m. to 10:30 p.m. Thursday at 1600 Pacific Highway. Shuttles will run between the San Diego Convention Center and the park from 5:15 p.m. to 10:30 p.m.
It’s dark inside but that’s what draws you into the GeoLounge. Sink your weary self into a bean bag chair and take a catnap, send a work-related text to the boss, or—better yet—strike up a conversation with another geolounger. Open daily during conference hours in Ballroom 20 A. 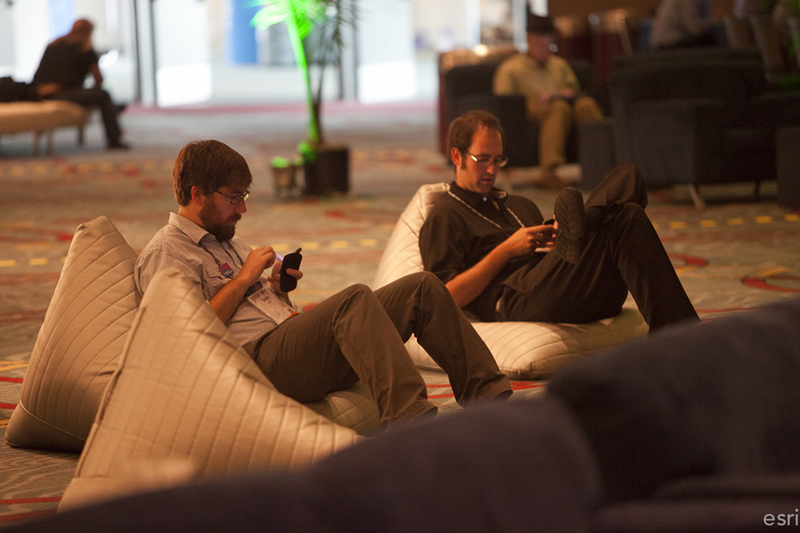 Take a break from the hustle and bustle of the Esri User Conference inside the GeoLounge. Bring your children ages 5-14 to the GIS Kids Fair to solve geography quizzes and other spatial brain teasers. They will work with maps of the Americas, Europe, Asia, Australia, and Antarctica. 9:00 a.m. to 5:00 p.m. Tuesday; 9:00 a.m. to 4:00 p.m. Wednesday; and 9:00 a.m. to 2:00 p.m. Thursday in the San Diego Marriott Marquis & Marina, Salon D.
Listen closely because Esri experts like Andy Gup will try and tell you a lot about ArcGIS in mere minutes. Does your map seem cluttered, or do the symbols look a little quirky? The truth can hurt but no pain, no gain. 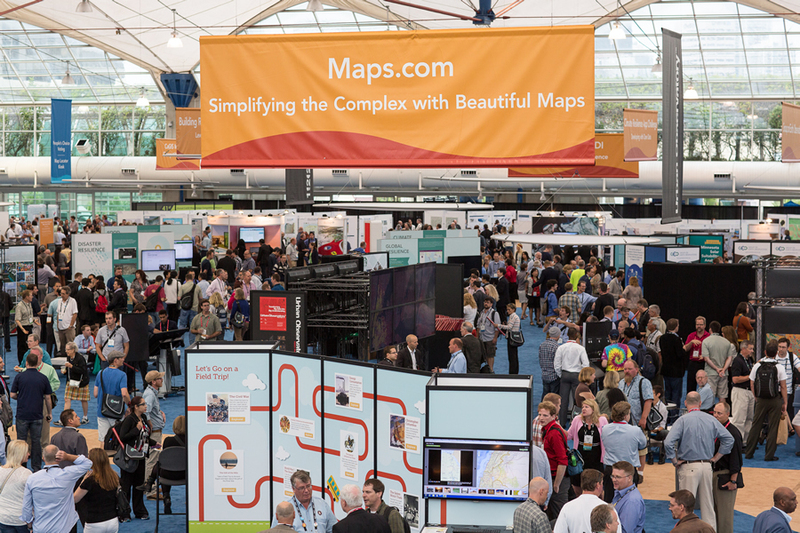 Visit the Map Critique Station, where Esri cartographers will offer ideas on how to make your map easy to read and magnetic. 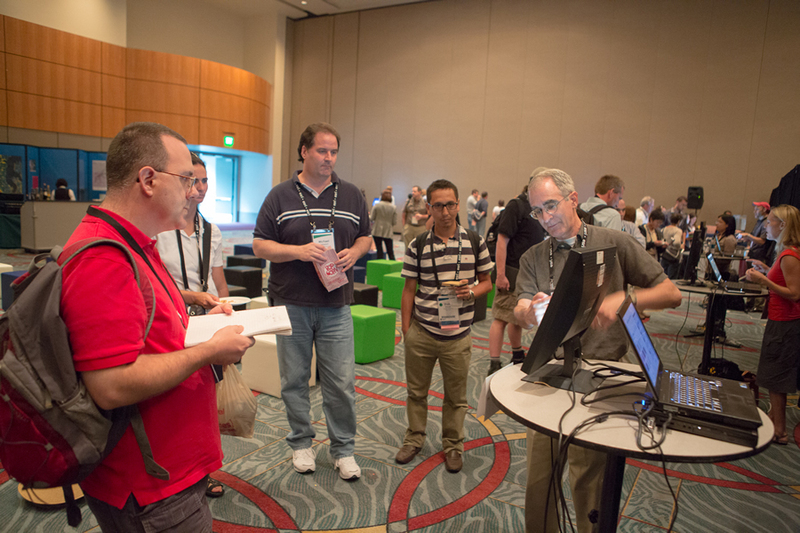 Open Tuesday and Wednesday afternoons and Thursday morning in the Technical Support Island of the Esri Showcase. Go mobile. Grab a bite to eat at the food trucks outside the San Diego Convention Center. Want a fast meal? Save the delectable Greek, Indian, and Brazilian dishes you want to savor for your treks to the Gaslamp District. When you are short on time, grab a scrumptious lunch at one of the gourmet food trucksparked between the Hilton San Diego Bayfront and the San Diego Convention Center. Take a break. Rent a bike. 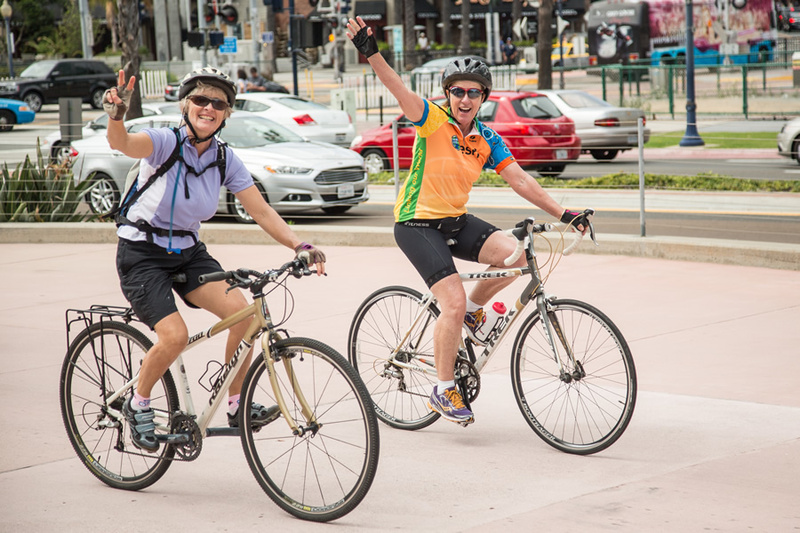 Unwind after a long day of presentations and tech sessions with a bike ride on the Embarcadero or other routes on 1,340 miles of bikeways in the San Diego area. View the map. Rent a bike from The Bike Revolution, 522 Sixth Avenue. The shop is open from 9:00 a.m. to 5:00 p.m. daily.